New Baby Arrival Picture Jewelry. Our Lighthouse on Grass Hill Pin makes the perfect gift for that lover of lighthouses and the sea. There is something so calming and beautiful about seeing a lighthouse in the middle of the ocean, guiding you to shore. The lighthouse has long been associated with both spiritual guidance as well as personal guidance in life. Give someone special this Lighthouse on Grass Hill pin and light their way to a better tomorrow. 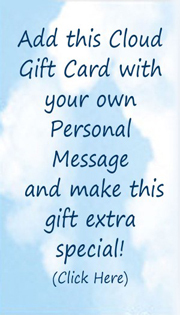 PERSONALIZED GIFT CARD: Make This an Extra Special Gift with your Personalized Message on a Colorful Gift Card that will be included with your item. 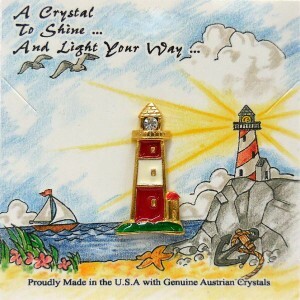 This Lighthouse on Grass Hill Pin comes with a Genuine Austrian crystal Topaz stone light on top. The lighthouse is 14Kt gold finished with hand painted red and white sections and sits on a green epoxy hilltop. 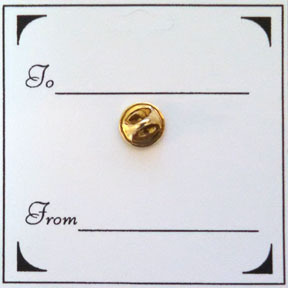 A “To and From” is printed on the back of each card so you can sign and address this special gift for that special someone. Help support America, buy an American made product, and support the small U.S. manufacturer in their constant fight against low priced imports and low quality goods. We offer a lifetime guarantee on all our products to you, the consumer. If for any reason your product fails, we will replace it free for life, just pay shipping charges.